I researched recipes used by the French traders and the Native American peoples during the era. Our Scouts cooked them all (no help from parents) and took home several first place prizes. The favorite, by far, was a recipe for “Bean Pot,” which is really a nod to Cassoulet. (The boys, I think, loved fry bread the most…) By the way, I love Cassoulet, almost any Cassoulet – simple, authentic, it doesn’t matter to me. I couldn’t wait to try Michael Chiarello’s version, Bean Cassoulet with Fennel Spiced Chicken and Roasted Vegetables. Surprise – I didn’t really care for it – but the recipe included the most AMAZING Brussels Sprouts, par cooked, sautéed in olive oil and tossed with this incredible spice mixture. I started nibbling them as I made the Cassoulet and I had to remake the entire portion of Brussels for the Cassoulet – I’d eaten them all. I just couldn’t control myself! I’d sprinkle on a little of the rub, then eat a few, then another sprinkle, and eat a few more. I’ve since remade the Brussels many times. Michael – you are a genius! The rub is intense at first, but the flavor mellows quickly, and if you’re like me, you’ll want to sprinkle a bit more on just before serving. Do use the white pepper – substitute any sea salt for the grey salt unless you wish to seek it out. Trim the Brussels sprouts by removing the tough outer leaves and stems. Halve lengthwise. 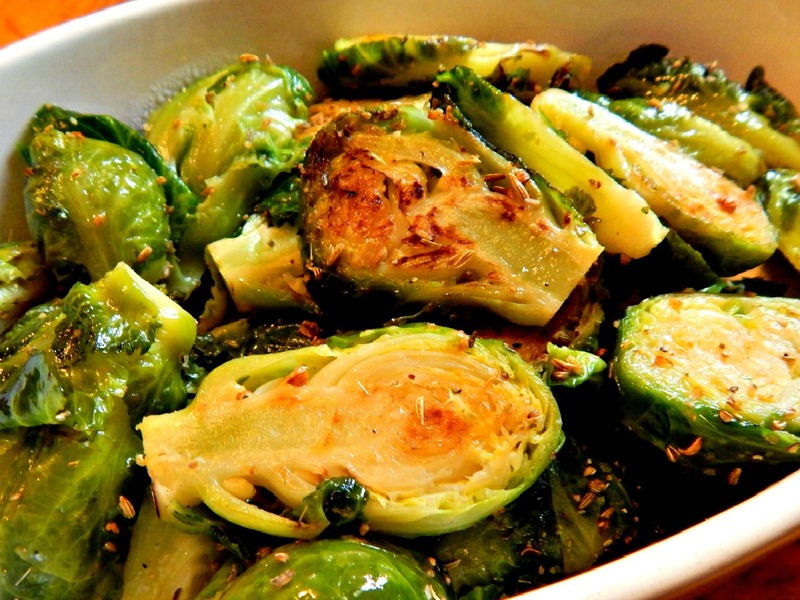 Cook the Brussels sprouts in boiling salted water for 6 to 8 minutes until just tender. This is going to vary depending on the size of your Brussels. Don’t overcook these – you’ll be browning them next. Drain and set aside. Heat olive oil in a skillet. Add the cooked Brussels sprouts to the pan. Toss until well browned, several minutes, turning as needed. Remove to a bowl and season with Fennel Spice Rub, tossing to coat. Brussels Sprouts: I’m posting in the summer because I didn’t get around to it last fall, but Brussels Sprouts are always best in the fall, and generally at their lowest prices. Look for them on the stalk – and splurge, if necessary. Spices: I never worry about buying some of the more obscure spices in the whole form – the coriander and peppercorns, especially keep forever in an airtight container in a dark, cool space. The fennel has a long shelf life, as well, but will lose flavor – throw it in your pizza sauces. It adds a key spice that is so often missing in the modern-day pizzas. It’s worthwhile seeking out the white pepper – you’ll find yourself finding all kinds of uses for it, and it’s so easily discounted. It brings that elusive flavor you might find missing from many of your Asian and Thai dishes, and is excellent in cream sauces. Salt: Sea Salt is excellent here, but consider kosher if you don’t have it. Try these Brussels Sprouts grilled. Saute onion or shallot with the Brussels. As mentioned before try this rub on other items – meats, chicken, etc., or other vegetables. I can’t wait to try this with asparagus. This entry was posted in Click here for Fabulous Food Posts and tagged Brussels Sprouts, Fennel, Frugal Hausfrau, Michael Chiarello, Olive oil, Side, Vegetable Side. Bookmark the permalink.